Gum disease affects most people at some time in their life. If you're experiencing sore gums, it's important to get professional help straightaway to prevent the issue from escalating. Alpha Health Clinic takes same-day bookings – helping to treat the disease early. The spectrum of gum disease (otherwise known as periodontal disease) ranges from mild gingivitis to severe periodontitis. WHAT ARE THE SYMTOMS OF GUM DISEASE? Gingivitis is a mild form of gum disease and is easily treated at Alpha Health Clinic. It is important to stop gum disease at this stage, as the longer plaque and tartar remain on the teeth the more detrimental it can become. If left untreated, gingivitis can advance to periodontitis, where gums retract from teeth and form spaces (called 'pockets') that become infected. 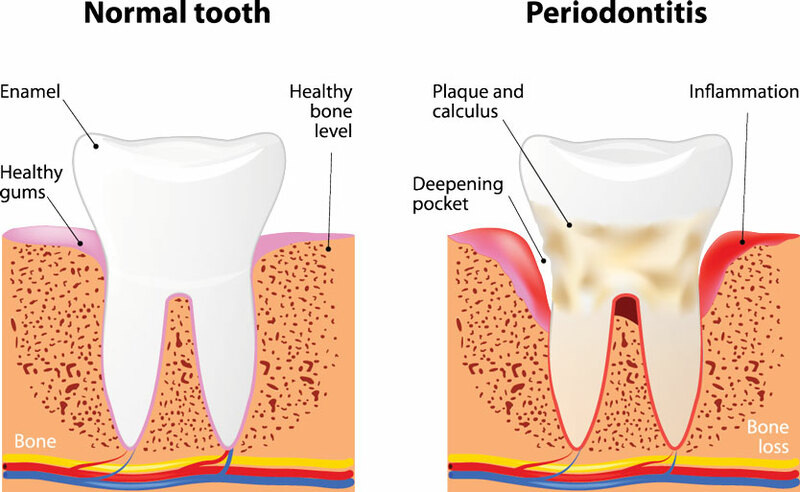 Whilst the body's immune system naturally fights bacteria, the plaque can still spread below the gum line, breaking down the bone and connective tissue holding teeth in place. To reduce the risk of long-term issues caused by gum disease, we advise treatment is sought from us upon recognising any symptoms listed above, or other indicators that may be causing concern. Alpha Health Clinic's solution for periodontal disease generally involves soft tissue grafting, pocket reduction and overall regeneration.